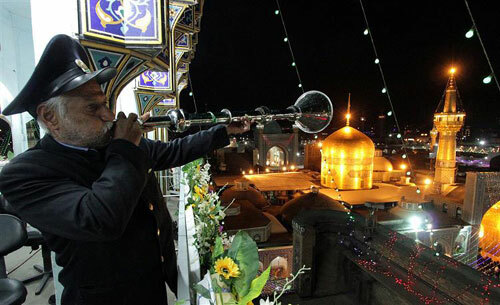 On the birthday eve of Imam Baqir (A.S.), the servants of the compassionate Imam’s Shrine, after the prayer call and performing evening and night prayers, in timpani houses facing the golden dome of the Shrine enunciated the birthday of the magnanimous Imam and the arrival of the month of Rajab. Coincident with the birthday eve of Imam Mohammad Baqir (A.S.) and the start of the Rajab's month, the timpani houses of the Razavi Holy Shrine sounded, and their glorious echo made pilgrims and neighbors of the Razavi Illuminated Court in Mashhad (A.S.) cheerful. The courtyards of Imam Reza (A.S.) were decorated with flowers and the flower aromas filled the Shrine’s space. Tonight many pilgrims from all over the country were the guests of the Razavi Illuminated Court and the servants of Imam Reza (A.S.) hosted them appropriately. On the occasion of this luminous night, a special program by the Deputy of Islamic advertising of Astan Quds Razavi has been prepared for all pilgrims who attended the Razavi Holy Shrine which is currently underway. In this glorious night, the preachers and eulogists of the Infallible Imams (A.S.) will read eulogies in the description of the fifth Imam and Hujjat al-Islam wa al-Muslimin Alireza Panahian will give a speech.